nanoSTAIR presented a poster on "paving the way from research to standards in the field of nanosafety: the nanoSTAIR support and pre-normative work" at SENN2015, on 12- 15 April 2015, in Helsinki, Finland. The nanoSTAIR newsletter informs about standardization activities and results in the field of nanosafety, about related coming events and about nanoSTAIR's activities. nanoSTAIR's Practical Guideline for researchers and other parties is now online! Standardization is one of the most adequate solutions to quickly capitalize and disseminate knowledge in “reference documents”, and have it implemented in the industry. It is very important in the field of nanotechnologies since the production of knowledge is very intensive. 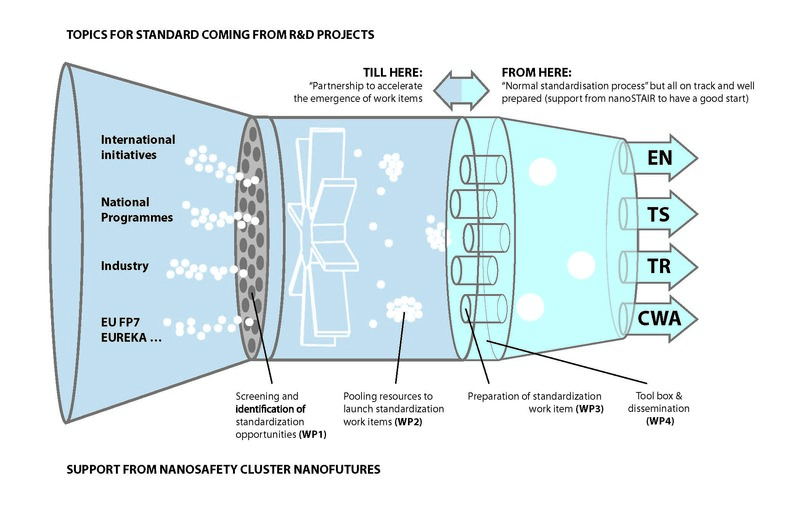 The overall objective of nanoSTAIR project is to build a sustainable process and platform in the field of nanotechnologies to support the transfer of knowledge gained through research to documentary standards in the context of the STAIR approach promoted by CEN-CENELEC. The project is organized around several activities that will boost the development of new documentary standards. A mechanism will be set up to identify, with a bottom-up approach, the opportunities for standardization from the results of research projects, co-funded by the European Commission or by National Research Programmes. This mechanism will be established using existing networks and initiatives such as NanoSafetyCluster or NANOfutures, as well as the network of the national standardization bodies in the various Member States. As a result, nanoSTAIR will provide a set of procedures, a tool box and a practical guideline that will be useful to bridge the gap between research and standardization in nanotechnologies. nanoSTAIR will structure and ease the development of new documentary standards, and thus enable the European nanotechnology related industry to rapidly operate according to the state of the art and thus increase its competitiveness. Knowledge developed during the project will be collated in the form of reports and conclusions of discussion workshops, but also practical tools that will be used and exploited after the end of the project. The most important outcomes of the project are the nanoSTAIR platform that will bring together the best experts to launch standardization work item proposals and the nanoSTAIR process to develop new work item proposal. The nanoSTAIR platform will be a place to find information, a place to find and meet potential partners, a place to find support… The nanoSTAIR platform which is a virtual table where all stakeholders will have the opportunity to share common needs and solutions regarding new documentary standards. The nanoSTAIR platform will in particular bridge the research community and the standardization community. You can join the nanoSTAIR platform by applying with the on-line registration form. The nanoSTAIR process will be described in procedures, checklists and communication channels. The nanoSTAIR process can be seen as a turbine that accelerates the preparation of new work item proposals by identifying the potential candidates, by making explicit the needs from the main stakeholders and by pooling the resources and expertise to reach the necessary critical mass. A presentation providing an overview of the nanoSTAIR project is available here.